Lords of EverQuest is a 3D fantasy real-time strategy game released in December 2003. It was developed by the short-lived startup company Rapid Eye Entertainment and published by Sony Online Entertainment (SOE). 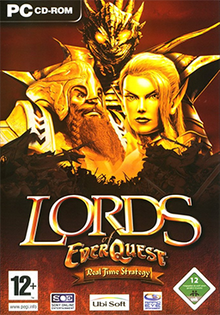 SOE distributes Lords of EverQuest. Unlike the original EverQuest, Lords of EverQuest is fundamentally a single player game, and after the initial payment for the software, does not require a recurring monthly fee in order to play. The game received "mixed" reviews according to video game review aggregator Metacritic. IGN reviewer Tom McNamara praised its multiplayer experience, but overall considered the game mediocre and decried it for focusing heavily on uninteresting combat fueled by only a single resource. The developer, Rapid Eye Entertainment, closed down after the release of the game. ^ a b "Lords of EverQuest for PC Reviews". Metacritic. Retrieved February 1, 2016. ^ Scott, Ryan (March 2004). "Lords of EverQuest" (PDF). Computer Gaming World (236): 76–77. Retrieved February 2, 2016. ^ Biessener, Adam (February 2004). "Lords of Everquest [sic]". Game Informer (130): 111. Archived from the original on November 21, 2008. Retrieved February 1, 2016. ^ Tokyo Drifter (December 1, 2003). "Lords of EverQuest Review for PC on GamePro.com". GamePro. Archived from the original on February 7, 2005. Retrieved February 2, 2016. ^ Ferris, Duke (December 2003). "Lords of Everquest [sic] Review". Game Revolution. Retrieved February 2, 2016. ^ Beers, Craig (December 4, 2003). "Lords of EverQuest Review". GameSpot. Retrieved February 1, 2016. ^ Rausch, Allen (December 6, 2003). "GameSpy: Lords of EverQuest". GameSpy. Retrieved February 1, 2016. ^ Lafferty, Michael (December 18, 2003). "Lords of EverQuest Review". GameZone. Archived from the original on February 5, 2008. Retrieved February 2, 2016. ^ a b McNamara, Tom (December 5, 2003). "Lords of EverQuest Review". IGN. Retrieved May 3, 2014. ^ "Lords of EverQuest". PC Format (157). January 2004. ^ Poole, Stephen (March 2004). "Lords of EverQuest". PC Gamer: 70. Archived from the original on March 15, 2006. Retrieved February 1, 2016. This Sony Online Entertainment-related article is a stub. You can help Wikipedia by expanding it.